The pub is still open selling beers from Schlossbrauerei, Reckendorf. Great ambience (bustling) and run by a hard-working owner. Ask if the dark beer (dunkel) is on - malty and sweet and easy to drink. Go to this brewery soon - it is very small and may not survive. Do your part and support good Franconian beer! The inside story is that the brewery is for sale and will close at the end of the year unless a buyer is found. 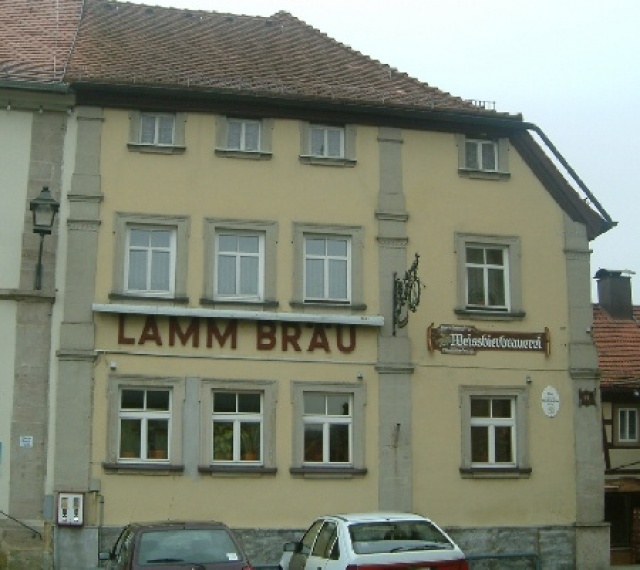 Lamm-Brau provided the starting point to a very enjoyable, if painful day last summer (2004). Their Wheat beer is the best in Germany (if you ask me). Unfortunately the afternoon was marred by the presence of one "Bernard Denbow" who subjected us to his foul brand of "British" humour. Oh, and by the way, Frank, Jurgen & Wolfgang.... we'll get you in the rematch!!! Sadly, Herr Lamm has stopped brewing and now serves the Recken beers from Reckendorf.